Through cutting-edge empirical, historical, and ethnographic scholarship, students and faculty in the Department of Anthropology address the urgent social and political problems of the 21st century. Widely regarded as one of the leading anthropology graduate programs in the US, this lively community of active scholars hosts a dynamic intellectual environment with equal emphasis on fieldwork, archival research, and theoretical reflection. Since its inception in 1971, the Department of Anthropology has been dedicated to providing the interdisciplinary breadth necessary for innovative research. The department has close relations with the entire faculty of The New School for Social Research and the university as a whole. 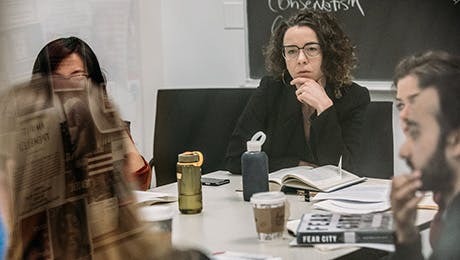 The department fosters an intimate, dynamic intellectual environment in which students can thrive, emphasizing critical reflection at all levels of inquiry. Students explore analytic and social issues through ethnographic fieldwork, archival research, and theoretical reflection, with work characterized by carefully conducted ethnography, innovative research methodologies, and an awareness of the importance of historical context. The Department of Anthropology offers MA and PhD degrees. All anthropology students at The New School enter through the MA program. Students who complete MA requirements with sufficient distinction may apply for admission to the PhD program. Anthropology is a discipline for which "knowing that" is intricately entwined with "knowing how." We offer a two-track curriculum that explores these two critical approaches. “Perspectives” courses provide different points of view on the objects of anthropological research. “Practices” courses emphasize how to approach these objects-on the basis of ethnographic fieldwork and other research methods.